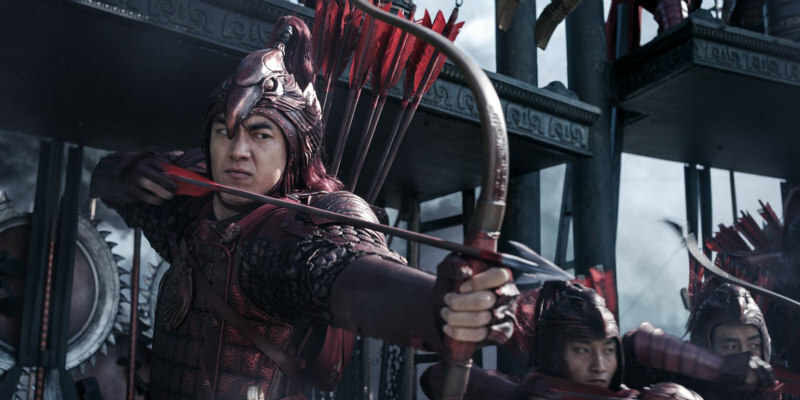 As the Chinese action epic The Great Wall arrives on UK home video, we look at some of the biggest battles to grace the screen in recent decades. Few things stir an audience as much as a rousing battle sequence, something evidenced in the gloriously enjoyable The Great Wall, coming to Digital, 4k Ultra HD, 3D Blu-Ray, Blu-Ray, DVD and On Demand from June 12th. In Zhang Yimou’s English language feature debut, Tian Jing and Matt Damon fights hordes of scaly dragon-like creatures who are threatening to wear down the eponymous wall’s unparalleled defences and sweep across feudal China in a murderous rage. Incredible set design and explosive action sequences pepper a gloriously colourful and inventive 100+ minutes, all the time reminding audiences of the power of a fantastic cinematic battle. In honour of The Great Wall’s release, we take a look at some of the best battle scenes out there. Take aim! The Setup: There is a huge amount to admire in The Great Wall, not least of which is the scale and magnificence of the fight sequences. This is never better illustrated than in the triumphant final battle, taking place inside the royal city, as dragon-like alien creatures, telepathically linked to the Queen, threaten to overwhelm a populous woefully under-prepared. The Battle: Matt Damon, having pitched into the fight against the dragons at the Great Wall of China (following an attack of conscience midway through robbing the place of its gunpowder) jumps onto a hot air balloon and flies to join Tian Jing in the rescue of the royal city, chasing the Wall’s imperial guard and mastering balloon flight years before Da Vinci had the idea. We cannot tell you how amazing this is. Next, Damon and Jing employ a potentially lethal decoy mission to lure the Queen into position, just as a myriad of the scaly green critters eat the upper hand as they gain it. Honestly, a combination of winning production design, inventive creatures and some genuinely thrilling wire work combine to make this an air-punching final battle in a film set to become a classic of Chinese action cinema. The Setup: The good guys (including Aragorn (Viggo Mortensen), Legolas (Orlando Bloom) et al, are holed up at Helm’s Deep, and the Orc army has arrived. Despite manfully facing up to the challenge, the odds are stacked until a resurgent Gandalf The White (Sir Ian McKellan) shows up with some help. The Battle: There’s a lot to admire in the Lord Of The Rings Trilogy, as well as a lot that hasn’t aged well (Bloom surfing on a shield, anyone?) but there is no doubt that the Battle of Helm’s Deep was a game changer in cinematic terms. Lasting for around 40 minutes, the sequence is breathtaking in both scope and scale, providing tiny, human moments and, beat after beat, jaw dropping, sweeping shots that beggar belief. Even if the audience is essentially waiting for the rescue from the off, it’s no less incredible when it comes, with Gandalf cresting a mountain in a shard of light only to usher in thousands of valiant saviours on horseback to turn the tide against what felt like an unstoppable wall of angry green guys. Go! Run, Watch again! The Setup: With the second Death Star nearing completion, the Rebel Alliance launches a gutsy three-pronged attack against the Galactic Empire. What the Rebels don't know is that the Death Star is already operational, and the Emperor has been awaiting their arrival. The Battle: Star Wars fans have a strong loyalty to the battle on icy Hoth in The Empire Strikes Back, but we prefer the series-ending Endor battle for its rousing underdog charm and non-stop action. Logically, there's no reason for the Empire's elite to lose, but who's keeping track? Do we want the Empire to win? No! This battle scene is a keeper because it continually engages the audience with a trio of compelling story threads. In space, Lando Calrissian and the rest of the Rebel Fleet are scrambling to avoid Death Star hits by dangerously engaging the powerful Imperial ships. On Endor, Han Solo, Chewbacca, and the furry Ewoks are taking on stormtroopers and AT-ST walkers. The most suspenseful moments come from Luke Skywalker's final showdown with Darth "Dad" Vader and the evil Emperor on board the Death Star, though. The Setup: June 6, 1944. Captain John H. Miller (Tom Hanks), Sergeant Michael Horvath (Tom Sizemore) and Private Daniel Jackson (Barry Pepper) are among the Allied forces arriving by sea to Omaha Beach to face the German army. The Battle: With this merciless and shockingly realistic 24-minute battle, Steven Spielberg proved once again why he's one of the best. The sounds of crashing waves against the fleets of dedicated (and seasick) soldiers make for a chilling opening of what is arguably the most true-to-life war scene ever filmed. To bring this historical battle scene to life, $11 million was spent on the scene, which features genuine WWII crafts and more than 1,000 extras (among them Irish soldiers). Not content to focus solely on the land elements of the battle, Spielberg also utilised dozens of underwater cameras and fake blood to re-enact the plight of soldiers who were fighting from the water. We're not alone in naming this battle scene the best. Empire magazine and TV Guide have both recognised it for its gripping visceral qualities and its lasting memories for any viewer who witnesses it. There simply isn't a signature moment to choose from when the entire scene functions at a level above the rest. It's all top-notch. The Setup: Jon Snow and his merry band of cohorts from north of t’wall face off against Ramsay Snow/Bolton in a battle that, even by Game of Thrones’ standards is brutally realised. The Battle: Where to start? Poor old Rickon Stark learns too late the value of running in a zig-zag before the battle has even started. Then, Jon Snow’s army, consisting largely of Wildlings and other ne’er do wells, is quickly overwhelmed by Bolton’s forces. Corralled into the middle of the battlefield, they are soon surrounded, and things are looking unnervingly bleak for the rumoured Prince That Was Promised. Enter, stage left, the duplicitous Peter Baelish and a much needed army (summoned by the hand of Sansa Stark in a move that may yet foreshadow the events of the final two seasons) and the tides are suddenly turning. Acclaimed as one of the best sequences in a series replete with staggering battles and knife edge politics, Battle Of The Bastards astounds from the off. The sequence involving Snow and the Wildlings practically suffocating one another was impossible to tear your eyes away from and the sheer weight of the world that is practically visible on Jon Snow’s face is hard to forget. Still, it ends (SPOILER) with Ramsay Bolton getting his comeuppance; there is no show currently on air that understands the importance of the pay off as well as Game of Thrones, and the Battle of the Bastards pays off in spades. The Setup: In Sparta, a Persian army of 1 million is expecting to conquer King Leonidas (Gerard Butler) and his 300 Spartans. Their initial fight would be only the first in a gruelling three-day ordeal that still holds strong as a symbol of courage. The Battle: After the Persian forces demand their enemies put down their weapons, the Spartans boldly yell, "Come and get them." What follows is a claustrophobic battle with both sides pushing against each other before Leonidas leads a valiant and bloody onslaught against the Persians. The scene's calling card is a slow-motion, sword-slicing charge by Leonidas that results in prolific (and stylish) carnage. There's also a visually arresting cliff-side confrontation that leaves the Persian enemies falling to their deaths. The battle's ultra-stylised look stays true to Frank Miller's graphic novel, and was accomplished by filming on a Montreal soundstage and digitally adding the backgrounds later. The Great Wall is available on Digital, 4k Ultra HD, 3D Blu-Ray, Blu-Ray, DVD and On Demand from June 12th.